Each lock only has one correct key! Looking for a fun curriculum review game that works with almost any subject? 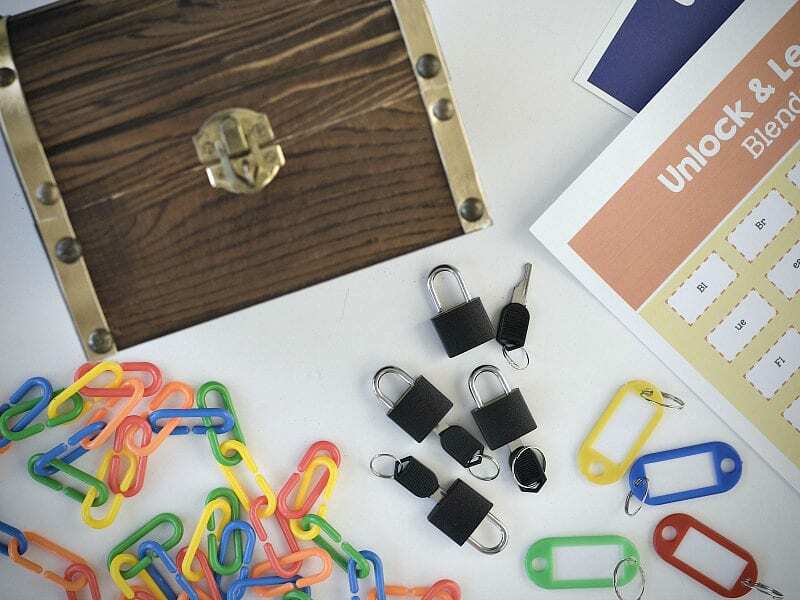 Try our treasure chest unlock-and-learn game. Take a look at our video of how this project came together. You can use this concept for just about any subject. We created a few PDFs, which you can save and print for free, that focus on blends, state capitals, the periodic table, and multiplication facts. There’s also a blank version so you can create your own. 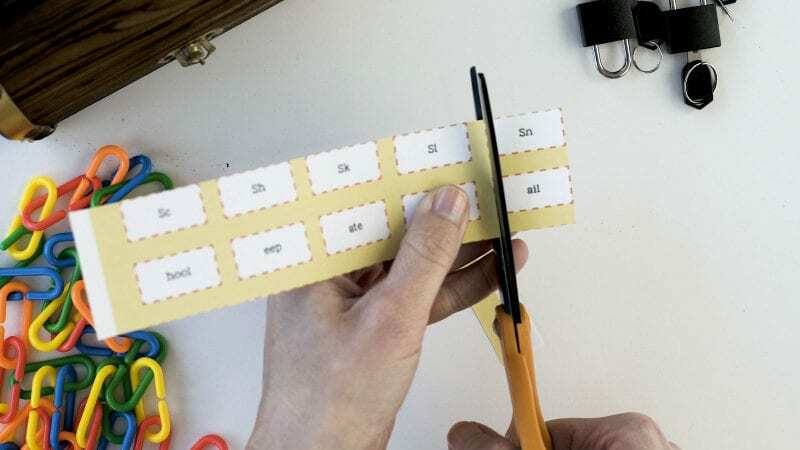 After you have this ready to go, cut out the individual rectangles. 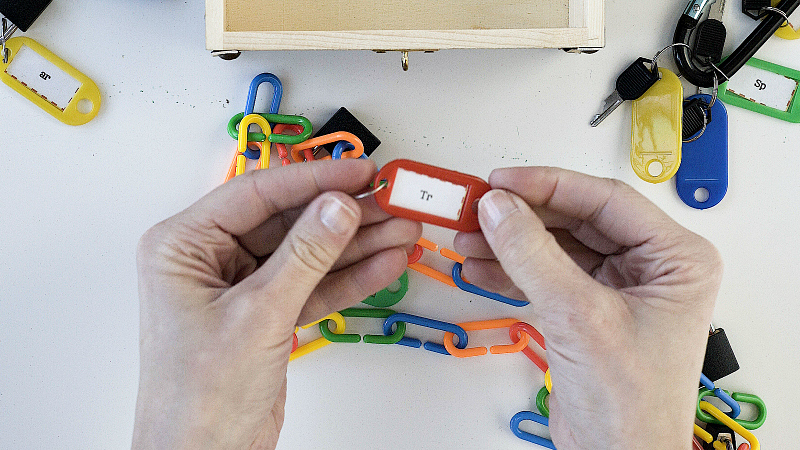 Insert your words into the key tags. These key tags are great because you just slide the paper inside. As you do this, be sure to keep your matches together so you can coordinate with the locks and keys. 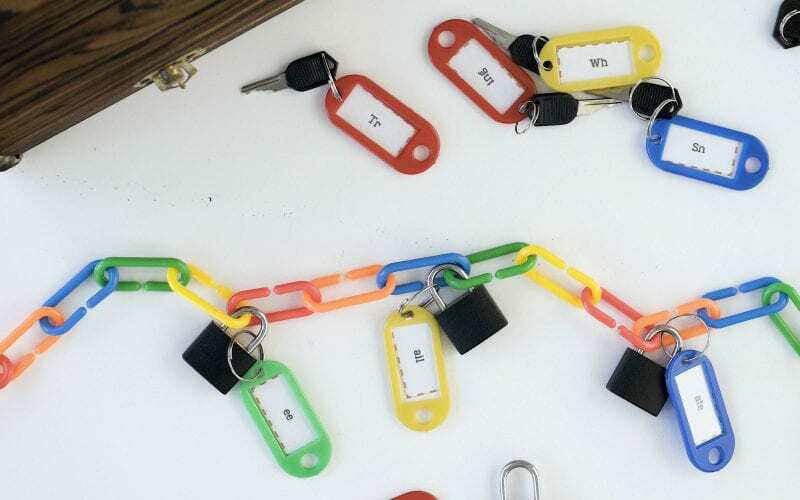 Attach locks and keys to your key tags. 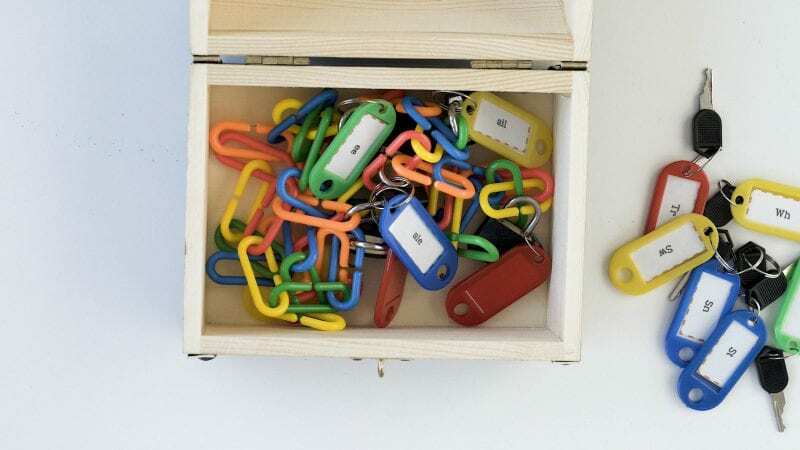 Now that you have your matches together, go through and attach your locks and keys. 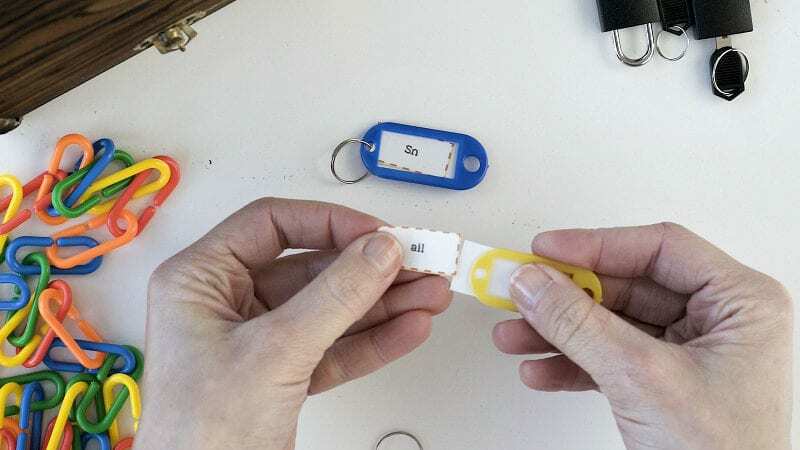 We recommend doing this one at a time so you can be sure to attach the right lock and key to the right tags. (It’s very easy to get confused.) Another thing to keep in mind is that you need to make sure to have locks and keys that are ALL different. This set on Amazon was our top pick because they guarantee that the keys will all be different. Check your work once more and then go ahead and separate the locks and keys. We like putting the first part (or the question) on the key and then the second part (or answer) on the lock. You’re almost ready to put your students to the test! Just attach your locks to the chain. Then we recommend putting all of your keys on a carabiner clip. Once you put everything in your treasure chest, you’re all set! You can do this activity without the treasure chest, but we think it adds a lot of fun. 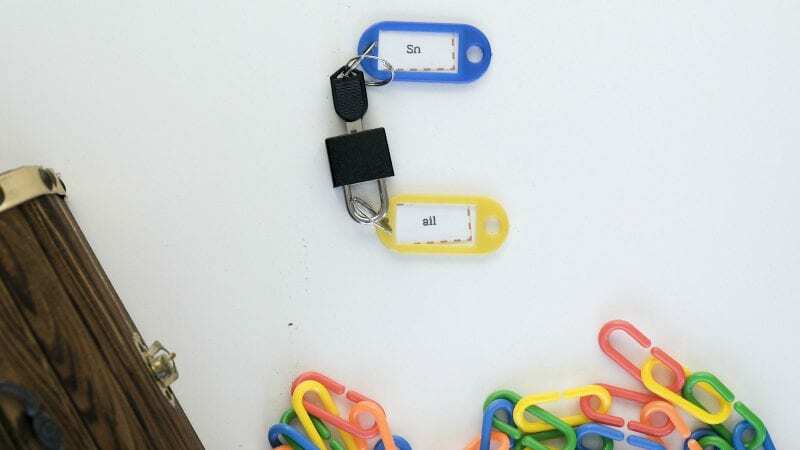 Students will love choosing a key and then finding the right answer to unlock. Share your curriculum review ideas and games with us. Submit your photos on our WeAreTeachers Chat group on Facebook. Plus, get our foolproof recipe for these DIY classroom stress balls.